Irish Captain, Linda Caulfield, has decided to draw a line under her international hockey career after amassing 151 caps and wearing the green shirt for nine years. Caulfield cited work reasons as the deciding factor, saying “there is a huge demand on players to increase their time on the pitch and the intensity of their training as we compete at the highest level against semi-pro teams. However, it is very difficult to commit to the training schedule along with the demands of work. I have reached a point where I can no longer manage to do both at 100% so unfortunately something has to give”. After gaining caps at all under-age levels, Linda earned her first under Coach Riet Kuper aged 20 against Russia in 1999. She was a regular from then on, clocking up her 100th Cap against China in 2005. 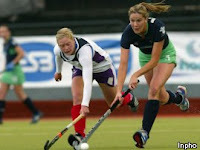 Caulfield was also the first hockey player to be honoured with The Irish Times Sportswoman of the Month Award in 2004. Linda took over the Irish captaincy in 2005 following Lynsey McVicker’s retirement. Since then, she led Ireland through numerous internationals including the world cup qualifiers in Rome, the Setanta Sports Trophy and the EuroHockey Nations Championship where she earned her 150th Cap against the Ukraine on 23rd August 2007. Caulfield will continue her hockey career at club level playing for Dublin team Hermes with whom she has experienced great success in the past. Orbinson will continue playing hockey for her club Pegasus, with whom last year she did the double, winning the ESB Irish Senior Cup and the ESB All Ireland Club Championships.